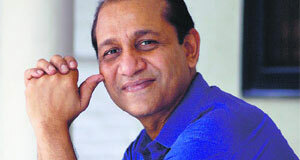 Quiz guru Siddharth Basu, the man behind the famous ‘Kaun Banega Crorepati,’ has made quizzing popular in India through his first game show ‘Quiz Time’ on DD in the eighties. From his jetsetting life on-screen, Siddharth still manages to find time for his loved ones, including his pet Sheru, a Golden Retriever. Affable and knowledgeable quizmaster Siddharth Basu comes from a background that covers theatre, radio jockeying and debating. 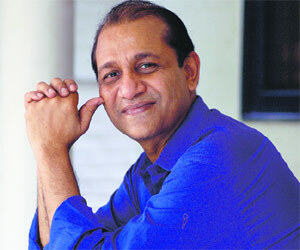 His first show ‘Quiz Time’ on Doordarshan paved the way for other quiz shows on the small screen. Today, he runs Synergy Communications Pvt Ltd, his biggest achievement being the successful ‘Kaun Banega Crorepati’ show, featuring Amitabh Bachchan. His wife Anita takes care of the logistics of running and expanding the company. Siddharth loves dogs but was unable to keep one in childhood. Anita also loves pets and wished to have one. Their wish came true when their daughter insisted on keeping a dog. Now, his family includes Shamsher Singh, fondly called Sheru, a Golden Retriever. The whole family loves Sheru and he has become an inseparable part of the family. D&P visited Siddharth Basu’s house in Sainik Farms — Delhi, where we were greeted by the adorable, big and extremely playful Golden Retriever and it was beyond doubt that this beautiful being could be named nothing but a royal one like Shamsher Singh, in short Sheru. We settled down with Anita Basu, who lovingly shared the Basu’s family life with Sheru. Excerpts. Both of us loved dogs but could not keep one for quite some time. Our life changed when our daughter Shreya came along. She was desperate to have a dog since the time she was a kid but since we did not have a garden at that time for the dog to move around, we did not keep one. We wanted our dog to have an enjoyable life, with lots of space to move around. So, when we shifted to our Sainik Farms residence, we adopted Shamsher Singh, a Golden Retriever. We fondly call him Sheru. Today, Sheru is 1 year and 2 months old. He is golden to the very word of it. He is like a child to us. One of the things we strongly feel is his inability to talk. He can only convey his feelings through his body movements, so it’s double guessing all the time. Aditya never wanted a dog but now he spends most of his time with him. They just can’t do without each other. Sometimes we are surprised as how most of our dinner conversations revolve around him, “What he does? What he did?” Sheru has become a common bonding ground for our family. Sheru is full of energy and it’s great for humans to have this “ball of energy” rolling all over the house. He perforces his energy on all of us, such is his energy level. And at the end of the day, he is like a sounding board. He responds to us intelligibly and passionately. All of us in the family constantly talk to him and play with him. He loves our company. We have a lot of understanding between us and hence I think he likes that all of us are always there for him, no matter what. Once while I was playing with Sheru, I injured my ankle and was in great pain. He sat by my side and was willing to help me in whatever way he could. Here, I would also like to mention that he kept giving me the look, “What did I do?” (laughed Anita). Playing with the ball. Retrieving is what he does best but never gives it back to us. We have to chase him around for the ball and he makes a whole new game for us. We love his gentleness and naturally loving nature. He loves to be loved and spreads love at the same time. He is friendly to everyone. Sheru has a great spirit of togetherness and believes that to be better acquainted, we should always share the same sitting place. Yes, he never fails to chew ankles or any other part of our body. Something has to be in his mouth constantly for chewing and nibbling. He is very oral about his demands. Perhaps the funniest incident was one when Shreya’s maths teacher came to our home. Sheru wanted to sit with him and could not find much place for himself. The teacher was getting really scared because Sheru is so huge and was pushing him off. We could not help laughing when both of them fell down. When the dog grows with you, you make an unbreakable relationship with him, which is so strong that you start caring for him like your own child. Whenever he loses appetite, we get worried. His unhappy face makes us sad. We give him a proportionate diet, which his doctor Dr. Harab has advised. Like it goes for all dogs, Sheru loves “bones.” He also loves all kind of meaty stuff. Chicken is not his favourite but he loves a lot of meat. We feel that Sheru – the tiger, loves going for his kill. We also get him a lot of doggy kebabs and chew sticks, which he finishes in nano-seconds. The moment you turn your back, it’s gone. He is really fast at it. He likes his doggy biscuits also. If you have a dog, then you should remember that you have taken a responsibility of a life and you should devote time, energy and treat them like another member of the family. They have emotions and are able to express them. Pets need a lot of emotional and mental support. They are very sensitive and we should give them lots of encouragement and support. Spending quality or just lots of time is very important since he is a part of the family. And one should not have a pet for guarding or just a “fancy breed.” One should be able to love him unconditionally at all times.